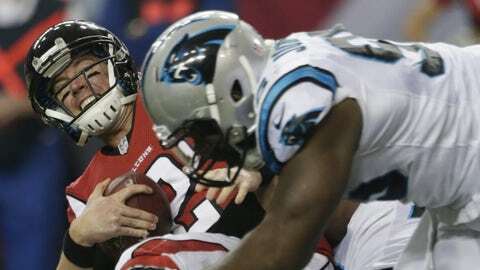 Falcons quarterback Matt Ryan was sacked nine times by the Panthers defense, including four times by Greg Hardy. ATLANTA — In the end, Carolina Panthers head coach Ron Rivera answered calmly and simply that, yes, he did have confidence in his defense when he punted the ball to the Atlanta Falcons with 1:20 left in regulation while clinging to a one-point lead. Why would he not? The welts after the game borne by shirtless Falcons quarterback Matt Ryan in his locker room would attest to Rivera’s reasoning. Ryan dropped back 50 times to throw on Sunday and Carolina sacked him nine times. The Panthers officially hit him on 14 other occasions. On their penultimate drive of the game, the Falcons’ offensive line resembled a crumbling sandcastle, as the Panthers sacked Ryan consecutively on second and third down, forcing a punt with 1:47 left. So, no, Rivera did not think about throwing a pass when Carolina got the ball back and had no doubts about giving it back to Atlanta one final time. "We felt really good about what we were doing defensively, we were really were," said Rivera, whose team completed a 12-4 season in his third campaign after finishing with losing seasons in each of his first two seasons. On the Falcons’ final drive, via the help of a somewhat bizarre play, Rivera’s strategy prevailed and the Panthers held on for a 21-20 victory at the Georgia Dome that propelled the Panthers to the NFC South title and a first-round bye. Greg Hardy totaled four sacks to finish the regular season with 15, tying Kevin Greene’s 15-year-old franchise record, and Charles Johnson added two of his own. A former linebacker on one of the great defensive team of all time, the 1985 Chicago Bears, Rivera achieved this turnaround by helping to develop talent like Hardy, who said he dominated breakfast when he woke up. "I dominate everything I do," he said, adding that his breakfast was cereal. "Killed it. No spoon." In part, that fear of the Panthers’ pass rush paid off without a sack on one of the game’s critical plays. With no timeouts, the Falcons started at their 12 on the final drive. They completed their first four passes, reaching a first down at their 43 with less than 40 seconds left, inching closer to field goal range. As Ryan spotted a blitz coming on his right side, he went to change the protection. Center Joe Hawley heard something different and prematurely snapped the ball with Ryan, in the shotgun formation, completely unaware. Atlanta running back Jason Snelling recovered the fumble for a 16-yard loss but the clock continued to run. Ryan desperately tried to clock the play but the Falcons were not lined up properly and received an illegal shift penalty, which resulted in a 10-second run-off. Back at their own 27, they had but nine seconds left. Two plays later, the game ended on an incomplete pass. The misbegotten snap helped to ruin the final game of Atlanta tight end Tony Gonzalez, who caught four passes for 56 yards, including a nine-yarder on the second-to-last play of the game. "Honestly, it went exactly as I thought it would go," Gonzalez said, "except the winning part." The winning part looked within reach as the Falcons scored a touchdown on their opening drive, the first time an opponent had done that all season to Carolina, which entered with the league’s top scoring defense. The Falcons expanded their lead to 10-0 but the Panthers began a comeback with the help of an interception by Carolina cornerback Melvin White that he returned eight yards for a touchdown. Atlanta wide receiver Harry Douglas cut in on the play but Ryan threw an out — right into White’s arms. "It was huge for us," Rivera said. "We needed a play. They were playing with a lot of emotion â¦ and we had to match their emotion somehow, had to have a play and Melvin White made a great play for us." Carolina took the lead 14-10 into halftime following a three-yard touchdown reception by Tedd Ginn Jr. with 19 seconds left in the second quarter. The lead see-sawed back a bit, as Ryan found Roddy White for a 39-yard score in the third quarter but Greg Olsen’s seven-yard touchdown reception with 4:20 left in the third quarter proved the game-winner. Matt Bryant made a 37-yard field goal for Atlanta with 7:10 left in regulation, culminating a 17-play drive. However, the Panthers’ pass rush proved the difference on Atlanta’s final two drives. The Panthers entered already having clinched a playoff berth. One benefit of securing the bye is the possibility that the Panthers could get back the services of No. 1 wide receiver Steve Smith, who was inactive on Sunday with a knee injury — a reality that seemed to hamper the Panthers’ offense, which was limited to 149 passing yards. Running back Jonathan Stewart also was inactive with a knee injury and quarterback Cam Newton was on the team’s injury report during the week with an ankle injury, though he looked mobile as ever with 72 rushing yards on 12 carries. By winning, the Panthers guaranteed themselves a first-round bye. That’s a long way from where the franchise has been since its last playoff appearance in 2008. "We were past due for a win like this and a season like this," Newton said, "but, like we said, in the locker room, we’re not sufficient with a win like this. We’ve got a lot of hungry guys on defense, offense, special teams, yearning to make this season even better."